2,018 readers have visited this universe since KumoriRyuu created it. During time immemorial, before the universe or even the concept of time existed… Two Gods Awoke to the vast emptiness of the Void. They were the All Father and the All Mother. The King and Queen, as well as Father and Mother of the Gods. They knew this, as did all who came after. Realizing that they didn’t have the power to accomplish the tasks which existed in their minds, they set about Awakening their Children to assist them in their labor. Their first child was the embodiment of beauty and power, and Awoke to the Void in a form entirely different to Her parents. With a serpentine body, massive wings which generated a hurricane with each flap, and a ferocious roar which made even the infinite Void tremble in fear, the Dragon Goddess, Sil’Eph Niir, was born. Eons passed and the emptiness of the Void was given form by the All Father and life by the All Mother. They, alongside their Children, then ascended to the Higher Plane, a separate realm from that of the Mortal universe. However, what they did not anticipate or realize at the time was that alongside the birth of this new universe was another realm born with it. A realm every bit its equal and opposite. The Nether Realm. And within this Nether Realm was the embodiment of all negative forces: The King of the Nether Realm (also known more simply as the Evil King). This Evil King began infecting the Universe with His negative energy which paved the way for all that is known as “evil” to exist in the world. Greed. Corruption. Cruelty. And more. Following the creation of the Mortal Realm, Sil’Eph Niir gave birth to Her first Child, Maglissos, a Black Dragon God. Drained of power by her labor, Sil’Eph Niir took to rest as Her Son continued to grow and flourish alongside her and the rest of the Gods in the Higher Plane. However, the Evil King launched an attack on the Higher Plane. Despite her condition Sil’Eph Niir, as the eldest and most powerful Child of the All Mother and All Father, took it upon Herself to do battle with the Evil King. The rest of the Gods fought against his forces, and the battle took a turn for the worse when Sil’Eph Niir was defeated. The King of Evil advanced against the All Mother and All Father, but Maglissos, still an infant, stood strong against the Evil King and delivered a powerful blow before being dealt a mortal wound by his Blade of Darkness. Out of rage and emotion at the death of Her Son, Sil’Eph Niir took to Her Dragon form to do battle with the Evil King once again. However, due to Her injuries, this battle saw Her fare no better than their first. In the end the All Mother and All Father sacrificed what remained of their life energy to Sil’Eph Niir thus giving Her the strength to overcome this almighty foe. Driven back by the power of the Dragon Goddess, the Evil King retreated to the Nether Realm. But not before His forces retrieved the corpse of Maglissos delivering it to His hand as He entered the portal to His realm of darkness. Following the loss of Her Son, and the sacrifice of the All Mother and All Father, Sil’Eph Niir sensed a new calling within the core of her being and Descended to the Mortal Realm to create and give birth to the first Children of Earth: The Dragon Race. As the first creatures ever to set foot on the planet and call it "home," they know instinctively they are the product of Sil’Eph Niir’s labor and love. Exhausted and drained of her power, Sil’Eph Niir took to hibernation in Dragon’s Cove at the center of the world. Her Children gathered around Her body and, to this day, stand watch over Her waiting for the day She awakens. All who venture into the waters of Dragon’s Cove are viciously attacked or turned away by Her sea-going Children. And so we find ourselves in the present day as mortals on Earth. A cult of eclectic humanoids worshiping the forces of Darkness have stolen ancient and forbidden magics which have since been activated and now siphon the life energy from the Dragon Race to fuel the rebirth of the now reanimated body of Maglissos within the Nether Realm. Having been reanimated and endowed with the power of the Evil King, his body has grown to maturity. As He gathers the energy of the Dragon Race, He awaits the moment His strength reaches its absolute peak that He may Ascend to the Mortal Realm to destroy His Mother once and for all in accordance with the will of the Evil King. And thus we find our heroes being sucked into this war between Gods and men. Will you help protect Sil’Eph Niir and Her Children from evil? Or will your story be one of many which perish in the flames of an ancient and unforgiving feud among Gods? If I do not receive an introduction from you about your desire to join, you will not be allowed to join. Communication is a basic courtesy, and if you can't share that courtesy with me then I don't want you here. 2) No God-Modding, Metagaming, or Power Playing. God-Modding - Making your character unkillable and constantly dodging any and all incoming attacks which could cause your character harm for the sake of them being invincible. Metagaming - Writing knowledge and experience which your characters does not or should not possess. If your character is a thief, they're not a field medic or surgeon. If your character is written to have experience with knives and bows, that's all they get. If they pick up a sword, axe, spear, or anything else, they don't know how to use it. Power Playing - Writing actions for other player-controlled characters to give your own an advantageous or superior position, and doing so without the consent of the player who owns said character. The use of any of these will earn you a one-way trip out of the RP!! This RP has much about it that differs from other fantasy lore you're familiar with. You may not, under any circumstances, presume you know something works and start writing for things or creating lore to suit your character or your own agenda. If you can't make a character who fits with the world and lore I've created, kindly leave. Pau'Ka listened to what the pair had to say and nodded slowly. "I understand." She said calmly. She looked at Neden and offered a smile. "I'd be happy to spend time and teach you more about your heritage. I don't know if I'll be the best teacher since I've never taught anyone anything before. But I'll do my best!" She extended a hand to Neden. "It's nice to meet you Neden." Neden's eyes widened when Dreux left her side and began to walk away from her, "Y-you said you'd stay by my side!! You coward!!" she exclaimed as she huffed as she looked at him walk off. Dreux chuckled and gave her a thumbs up and wave as he continued to walk out of the cave and walk back to the boats, "You'll be thanking me later, good luck, Ne!" Neden's eyes rolled as she looked at him as he disappeared out of the cove, a soft growl exiting her lips as she watched him walk away. And just like that, they were alone, left to talk about whatever it would be. Neden turned back to look at Pau'Ka that stood behind her and awkwardly smiled as she had introduced herself when Neden yelled at Deux for leaving her alone. "I-I'm sorry about that, Princess. That was...Not okay. My apologies." she said with a light blush and awkwardly rubbed the back of her head, her accent coming out rather strong as she spoke. She gently and rather awkwardly took her hand and returned the handshake, "It's nice to meet you as well. I-I'm sorry for being so awkward, I'm not very good with new people, much like Dreux explained." she said with an awkward chuckle and slightly swayed on her feet, trying to not feel as awkward as she did in that moment. Pau'Ka shook her hand and smiled warmly for her. "It's not a problem at all, Neden. Social anxieties born of isolation are common among all races. It's nothing to be ashamed of." She let go of Neden's hand and gently placed her index finger against her chin. "So what would you like to know? I'll answer as best I can." Meanwhile, Korose had wandered closer to the Goddess as well to speak to her mentally. You can hear my thoughts, correct? What's going on? Why are we here? Sil'Eph Niir let her answer carry to the entire group so that all may hear, including Az as she flew away even if this was a bit of a recap of what she'd heard before. The Evil King seeks to break the seal we placed on him long ago and escape to your world. His servants now siphon magical energies from around the globe in an effort to see this dark design fulfilled. If they succeed, he will grow stronger and likely attempt to overtake the Higher Plane just as he tried to do eons ago. You are all here because you hold ancient bloodlines blessed by the Gods. Once you awaken the power of your bloodline, you'll be strong enough to take the fight to his servants and prevent his escape from the Nether Realm. Seek out the Diviner on the tallest peak in the world in the frozen North, and he will help you awaken your long-dormant power. As their life force is siphoned to fuel the rebirth of my Son, Maglissos, under His wicked control, their forms become tainted and twisted into the beasts you fought previously. But they can be saved. If you combine your awakened powers, you can help sever the connection which siphons their life force and return them to normal. When they come back to themselves, they will aid you however they can. You have my word as their Mother and Goddess. Korose nodded, looking back to the others and now speaking out loud. "If anyone has any last questions for the Goddess, now's the time to ask. If not, we should leave at once for the frozen North. The sooner we awaken our bloodline's powers, the better. 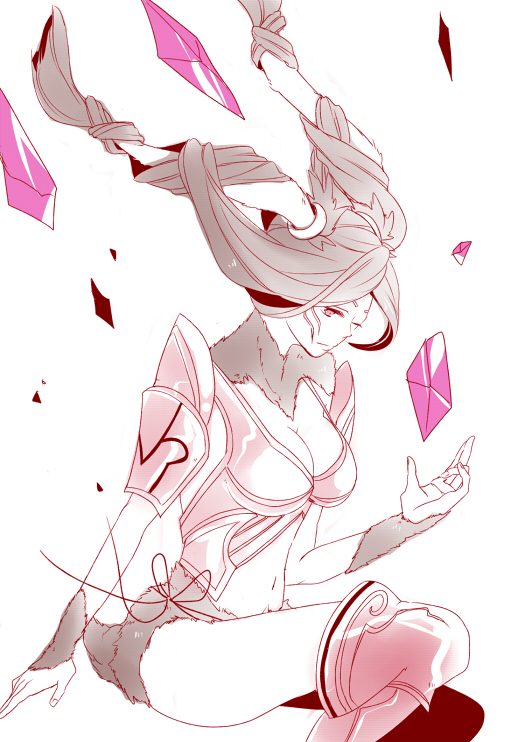 The Goddess may be on our side, but time most certainly isn't." He called out. Elena took a few steps towards Sil'Eph Niir, clasping her hands and dropping to her knees as she bowed her head in respect. Great Goddess Sil'Eph Niir. Will you not join us in this endeavor? I sincerely wish I could, dear Child of the Forest. But until my body has recovered from both my battle with the Evil King and my labor of creating the Dragon Race eons ago, I am unable to fully awaken from this state. Even now, despite this mental communication, my physical body slumbers and is useless to you. Elena opened her eyes and nodded quietly. We will rescue your children, great Goddess. I promise. We'll save them all. Elena suddenly received a mental vision of Sil'Eph Niir's beautiful human form smiling at her. Thank you, dear Child of the Forest. You've no idea the joy it brings me to hear such kind words. Elena bowed and turned around, ready to proceed with their mission to seek out the Diviner in the frozen North whenever the others were ready to join them. Neden listened silently as Pau'Ka reassured her that there was nothing to be ashamed about, which caused a small smile to appear on her face. She tried to think of what to ask about first, but there were so many different questions. But some she knew Pau'Ka wouldn't know the answer to, such as who she was and who her family was, since even the very Goddess of who she is a great decendant of doesn't even know. She continued to think silently, her right hand resting on her chin as she was lost deep in thought, biting her bottom lip as she tried to concentrate on what to ask. But suddenly that same voice was heard in her head again, the voice of Sil'Eph Niir, and clearly it was everyone that heard it as they all looked at her and nodded when she was done speaking. She understood the importance of time, especially knowing that Sil'Eph Niir would need time to heal, and she nodded. Turning back to Pau'Ka she motioned for her to stay for a moment, and ran back up to the mighty being that was laying still on the cove's floor. "I promise...We will help your children and you. For you and your children, fall and none...as well as for my clan's honor, and maybe finding out who I am. Thank you, Sil'Eph Niiir. We won't let you done. Just rest." she said softly, gently and nervously placing her hand against Sil'Eph Niir's red scales, feeling them under her palm for a moment as she gave a silent prayer of healing and safety towards the Goddess, and turned back around to rejoin with the group. As she neared Pau'Ka she spoke as she motioned her to join as they were slowly heading back to the boats, "We can talk about this as we head back to the boats if you like. But like she said, time is important, and I don't want to waste more of her precious time. But trust me, I have...a lot of questions.." she said as she gave the woman a small smile and nod, as well as a bow and began walking towards the boats, not sure if Pau'Ka would follow her or not. Aranaea paled at the message given. ”The North...? I don’t even have enough money for winter clothes!” She shouted in dismay as Zaldir looked at her with an incredulous look. ”I’ll see what I can scrounge up from my business coffers... I’m probably going to have to sell stuff in the next town the ships stop in before we head out.” He said to his sister in Elvish. He gave a small glance towards the High Elf woman and noted that indeed, she was pretty. He could almost see her as being a Noblewoman if he had the chance to. In the meanwhile Aranaea began to walk with some of the others, until she paused right near a foot of the dark haired elf. She could feel it if only barely. He was radiating heat off him like no tomorrow! Was he a fellow Fire Mage? Only way to find out was to ask him! Moving to walk side by side with him, she decided it was best to get to know at least one of her new group members. ”Hello there. I’m Aranaea Kestal of the Elven Clan of Kestal. Might I have your name?” she asked, bowing her head with the secret intent of scanning the handsome elf’s features. He seemed intriguing, worthy of her attention on her part. ”Steady Naea, You need to play hard to get if there’s a chance.” She scolded herself. But she could tell that he had an air of mystery about him. She wanted to learn more of this Mystery. Korose had been walking with Elena and Pau'Ka, sticking close to them since having disembarked the boats earlier. And when a certain blue-haired elven maiden walked over to him and introduced herself as Aranaea Kestal, he gave her a small bow and gave her a brief once over from head to toe before answering. She was beautiful. More so than many women he'd seen, regardless of race. Still, he had a job to focus on now. Admiring her would have to wait for a more appropriate time, providing such a time ever came along. Korose. That was his name. She smiled softly as she nodded at his name.”It’s a pleasure. Are you perchance a Fire Mage? You seem to exert an amount of heat.” she asked, getting to the topic of her wishing to talk to him. In the Meantime, Zaldir was walking behind his sister several paces behind her. He didn’t know what to make of it all, but he gave a silent prayer of thanks to the gods for the chance to finally understand that they were there and his small prayers were at least being heard. He gave a sideways glance towards the High Elf and gave a wave to her. ”Hello. I’m Zaldir, a Magic Blacksmith. May I ask what you are called?” Zaldir said in Elvish. He hoped he would be able to try and establish communication with her using his Elven tongue. If not, well no one could say he didn’t try. Though he was sure if Ardyn saw this and it failed, the horse would be laughing in his own way. Korose momentarily paused, his lips parting ever so slightly before looking slightly away. "I practice Shadowfare magic, actually." He said quietly. "The heat is... Due to something else. I apologize if it bothers you." Meanwhile, Elena noticed the wave from Zaldir and gave a small wave in return to him. As he walked over and asked in Elvish what she was called, she hesitated. She understood Elvish, but she could not speak it. So communicating with him was going to be tricky. Luckily, names were universal regardless of dialect. "Elena." She said, pointing to herself. "Cal'lik." She said, using her hand to motion like a mouth speaking and shook her head "no." She could only hope he knew what she meant. Having stepped up to the seasick lady (Though simultaneously keeping a ‘safe’ distance in case of projectile vomit), Carmen’s attention was diverted as the man named Dreux introduced himself. He was pretty formal, what with the whole ‘Miss’ Schtick. The only person who called her ‘Miss’ was her mother, and even then, that was ‘Little Miss’ and when she was in trouble. Regardless, he also introduced Neden, and the idea of ‘the call’ which was apparently the term for the voices in her head. Of course she knew that, but it was nice to know they knew what it was called too. Yup, she was clued in. As Carmen was about to comment, Dreux stepped in once more, clarifying Neden’s upbringing and bringing some much needed context. Oohhhhhh. She didn’t know how to swim! That explained it! Gosh, how weird. Who didn’t know how to swim? She must have really been from the boonies if they didn’t have a lake or anything to dip in. Well, that wouldn’t do at all! Carmen would have to teach her at some point, if they all continued to hang out. But for now, medicine did seem to be the order of the day. Making a gesture where she clapped her flexed bicep, Carmen gave the two a wink and a grin. “You can count on me. I’ll get it right now. Aaaannnddd you two can pay me back with an undisclosed favour.” Smirking, Carmen went to run past them and quickly scoot back to the ship, but was suddenly startled by the appearance of another shouting and appearing out of thin air! “Ack!” Flailing her arms about to maintain her balance and not collide with the unexpected figure, Carmen gave a faint sigh as she managed to catch her thumping heart. “Geez… Don’t do that! I thought you were a sea witch coming to drag me to the depths for my hubris…” Mumbling out the last part as she recalled a few childhood fairy tales, Carmen quickly stepped around the mystery figure, but decided to answer her question. “And we ARE here as part of a summons. We’re all Callies, though I don’t really know what we were called for…” Musing on this fact, Carmen was going to slip away when some loud but also not that loud stomping from the Succubus called for attention. Impressive she could do that on sand, and also that it did work in drawing everyone’s attention to her. Being somewhat nearby, Vernon sighed as she aggressively flailed the paper around to try and get both his and everyone else’s attention. He didn’t really intend to read it, but seeing as they were all ‘playing nice’ for the moment, it wouldn’t hurt to accommodate the delusional demoness. How quaint. She was addressing him personally. In his peripheral, Vernon could feel the seething hatred in her eyes, which only served to widen his smirk as he read, stroking his chin. Well now, she certainly was a radical thinker. Vernon hated the overly religious and preachy types, and it seemed that she was one of those. An ignorant one too, especially if she thought those dragons were just for show. Definitely more warning flags that following her as a subordinate would be a foolish idea. As she stormed off to try and lead the way, Vernon thought about commenting again, but felt a sharp elbow in his side, Carmen having returned up next to him while he’d been reading. Looking to her dryly, he got the message, and simply sighed again, folding his arms in front of himself once more. Probably for the best he didn’t comment. Those fanatical ones never did listen to logic or reason; and her inflated sense of pride in herself seemed to be rivalled only by her naivety. Maybe she’d learn her lesson before meeting an untimely end, but that overconfidence combined with a stupidity to rival Ruffles didn’t give her good odds. The rest of the group seemed to be in agreement that now was the time to move, but as the dragon moved to cut off Aznyxphia, Vernon immediately tensed, shoving his collection of weapons into Carmen’s hands. “Be ready.” He stated, the mermaid giving a quick nod in response. Vernon was eager to test his mettle against another dragon, but with a horde like this, even he had to concede that it was a suicidal prospect. That said, it would be interesting to see how their ‘Oh so mighty Leader’ handled herself in combat. Extending his hand to claim his first weapon from Carmen, he was surprised to find nothing there, turning to look at the smiling face of his first mate. “It’ll be okay. Wait for it.” Carmen grinned playfully, and although Vernon didn’t know what she was expecting, he trusted her. Moments later, a rumbling filled the earth, and the dragons around them returned to their rest. Emerging through the cave and travelling across the grasslands, when the group finally came across the goddess herself, Vernon was left in stunned silence, while Carmen faintly gasped as she looked upon the majesty of her enormous form. As the voice, louder than ever rang through Carmen’s mind, she could only faintly nod. Vernon however, clutched his head, hearing her words for the first time. It echoed through him, and faintly, he could feel his body trembling. Was it… Fear? He’d never felt afraid since that day… And yet… Clenching his fist, Vernon steadied himself. She was insurmountable to him, a presence beyond the scope of his world. He needed to become so much stronger. If this truly was the goddess Sil’Eph Niir… Then part of his life he had been living a lie. He was mortal. Human. There was no way he could challenge a being of this power… And yet… he would strive to. As Aznyxphia continued to prove her inexperience and inadequacy as leader, Vernon watched her stagger and stop, as if frozen in time. Clearly, the goddess had stepped in to stop her assault somehow. It took some time, but then, she was off, flying out of the cove, faintly gesturing for them to follow, but he wasn’t sure how she expected most of them to notice that – They were all a bit focussed on the being in front of them. A leader’s job was to lead, certainly; but it seemed she hadn’t learned how to communicate with her crew and read the room. Watching as everyone in the room took turns to speak to the goddess, clearly receiving answers in their mind, Vernon wondered what he had to say, if anything. As the group heard her explanation, more thoughts crossed his mind, and when prompted by that shadowy elf fellow, he still felt unprepared. Thankfully, he was given more time to think as his first mate Carmen stepped up, and, possibly braver than anyone else in the group, placed a hand against the goddess’s form. Watching Carmen speak to the goddess, Vernon finally had his own thoughts come to mind, raising his arm and pointing a fist directly at the Goddess’s eye. “I didn’t hear your call, nor do I have an ancient bloodline. I don’t even care for your plight. All I seek is strength, and worthy opponents. If this Evil King is as powerful as you say, then I see no reason not to fight. You should feel fortunate our goals align.” Grinning, Vernon pulled his hand back in. “One day, I’ll surpass even the gods themselves. When that time comes, I’ll challenge even you, Sil’Eph Niir.” Pivoting on the spot, Vernon had stated what he intended, making his way to leave. Turning to look over his shoulder, he spoke to the others. “The Delmoray is the fastest ship on the sea, and you won’t find a better crew. The Silverstar Pirates we’ll see to it we reach our destination. I’ll see to it that we’re prepared to leave at a moment’s notice.” Striding away, Vernon would leave the group to their discussions with the dragon goddess. None of that concerned him. Following Carmen's statement that she was a failure and providing details of her past, the Goddess of Dragons slowly lowered her towering mass of a head to look straight at Carmen, turning her head sideways so one house-sized golden glowing eyeball was resting right ahead of her. "Dear Child of the Seas, take more heart in yourself and what you can do. One's worth is not measured by the deeds of days gone by or memories which haunt you." She pulled her head back and up into the sky, peeing down at the group which remained. "Your worth lies far beyond such trivial matters." She said softly. "So go now, dear Child of the Seas. Forge your path forward with confidence and grace. And pray, take care of yourself and your friends. In this cruel world where nothing is certain, our bonds become our greatest weapon and our pillar of support." And then... It was Vernon's turn. "Child of man, your determination is admirable. However, I pray in due time you'll come to understand that true strength is not recognized by whom you can defeat, or how. It comes from somewhere much deeper and more personal... So go now. And pray, protect yourself well. The Darkness which lies ahead cannot be slain by mortal weaponry alone. You'll need something more." Listening to Sil’eph Niir, Carmen was unblinking as the huge eye stared at her; not scared, but still, frozen to the spot. As the voice filled her mind once more, it told her to have faith and believe in what she could do, along with the others around her. Carmen wanted to with all her might but… Taking a step back to bow at Sil’Eph Niir, Carmen didn’t voice her fears, but her mind was racing a mile a minute. She just had to believe in herself, like the goddess said… But she could be such a screw up! There was no way this would work, there had to be a mistake, the goddess… Carmen swallowed nervously. Was she really trying to challenge the word of a goddess? Sil believed in her… Needed her to succeed, just like the others. Even if Carmen couldn’t see it… Clearly, there was something she could do. The goddess believed in her. So she’d have to believe in herself too. “I’ll do it. I can’t say whether or not I succeed, but I’ll believe that I can, just like you believe in me! No matter what comes, I’ll give it my best, and try to protect everyone!” Carmen raised her head, bringing back her upbeat confidence in full swing as she brought her hand to her head, cocking her hat with a grin. “After all, I’m the maiden of fortune herself, Carmen Rufferones!” Spinning around to make a ‘cool’ pose to the others, she skipped over. She had to remain positive, no matter how scared she was. Sil’Eph was right. Bonds could be strength, and support was indispensable. She’d be that pillar for all of them if needed. “So, you think they’ll name a constellation after me when we save the world?” Carmen asked to no-one in particular as she re-joined them. For Vernon, even before the goddess had begun speaking, he’d found his resolve. He had his own strength, and he wasn’t about to abandon it for a new philosophy. In his mind, he conveyed one simple response to her words. “If no mortal blade will work, I’ll simply have to find a blade greater than the heavens themselves. That’s all there is to it.” It was true, he was mortal, and perhaps unfit to take on the demons ahead of them. That didn’t change anything for him. He’d simply have to surpass the gods. Even if it meant he was no longer human. And if he couldn’t become powerful enough to fight them, he’d find a weapon that could. Grinning, Vernon made his way out to the ship to explain to his crew. His passion had been reignited. He was looking forward to the trials ahead. Aranaea's cheeks visibly turned red when he told her his magical abilities. "Oh! I'm sorry! I didnt mean to pry! It's rare to see another elf sometimes in my travels, well aside from meeting my brother again after 50 years of separation." She said in apology/explanation. She continued to walk beside Korose, with the desire to speak with him some more. Zaldir on the other hand, was relieved that his name made it through the language barrier and learned her name. Elena, such a beautiful name for a High Elf. However, when she explained she didn't speak Cal'lik he visibly began to turn beet red, clear up to his ears. "Note to Self, See if I can find anything in my nick nacks to help her understand me better. I can't believe I embarrassed myself in front of a beautiful woman like that. And a High Elf at that!" He thought. He walked by her never the less, trying to at least observe her actions in an effort to get to know her better. Together the group slowly returned to the boats and made their way to the Northern Continent. The journey took approximately one week, but with all the boats traveling together and sharing in the bounty of the seas as well as their stockpiled goods, everyone was kept well fed and safe. Touching ground for the first time in just over seven days, the group all disembarked. Korose set foot on land and smiled slightly, glad to have the Earth beneath his feet again alongside Aranaea. Elena, having gone bare foot the whole time, stepped down and used her toes to grip the sand and dirt with a contented smile as she stretched her arms out to the sides and yawned. Pau'Ka, had elected to remain with Neden on her ship. The whole time she made Neden tea to help settle her stomach and deal with the sea sickness, even if it didn't quite get rid of it completely. She also took what time she could to teach Neden about little bits of their race's history and culture. The legend went that long ago the Dragons took to human forms during a terrible crisis at the earliest stages of the humanoid race's introduction to the world. During said time, they encountered a magical menace which used a form of magic never before seen to siphon their energies and create humanoid copies of them. These copies eventually broke free of his control with the help of the original Dragons and, together, they vanquished the menace and his armies of copy-cat races. At the end, the Dragons returned to Dragon's Cove while the humanoids remained as their own newfound race called the Draconians. Because they were copies, they couldn't fully transform into Dragons. But they did have a form which drew from their Dragon heritage which is what both Neden and Pau'Ka had done when they defeated the Twisted Dragons before meeting the Goddess. Meanwhile, as they touched land for the first time the Goddess reached out to them once again. "Everyone. Please beware. Having spent time in my presence your bodies are emitting residual Divine Mana which will attract the forces of Darkness to your location. Please always be on guard and ready to protect one another!" Korose took a deep breath and nodded to himself. Elena did the same, placing her hand over her heart and promising Sil she'd do all she could to help everyone. Pau'Ka nodded firmly, helping Neden work through her seasickness so they could move on together. In the following days on the sea, yet again, Neden had been on the bottom deck, nestled away in a corner of the ship as a way to keep her mind and eyes off of the ocean depths that lurked beneath them. The only thing reminding her that they weren't on land was the movement of the ship, too fluid and would occasionally toss and turn as they slowly traveled back. Neden had been forced to go on the same ship with Pau'Ka, Elena, and a few others, much to her dismay with how Dreux treated her. She was afraid of being alone, and with new people, not with Dreux as she had been the week prior. Which unsettled her a bit, too much for her liking. But she had been accompanied by Pau'Ka the whole time, with constant tea and herbs for her stomach, which she was honestly grateful for. While they were at sea, she had been told of her ancient history of their ancestors and where they came from, how they were related to Dragons, and how they could turn into one. Which explained what had happened to Neden when the dragon had attacked them at sea on that day. The truth and lore of her people both fascinated and scared the young girl, knowing what she was and the power she held amazed her, as well as worried her. But all the while, when Neden wasn't being educated by Pau'Ka, she was either asleep, reading the few books she still had from her village or was busily drawing in the small notebook that she brought, but seeing as she was slowly running out of room, she knew she'd need to get another one whenever they came upon a town or traveling merchant. Once they reached land, Neden couldn't have been happier. The grabbed their things from the ship and eventually grouped up again on the mainland. As she exited the ship she covered her eyes from the sun's bright and harsh rays, slowly growing accustomed to it as she blinked more. She stepped off the boat and felt her feet hit the sand from inside the boots she wore, knowing full they needn't be on a ship again or so she hoped, the sickness she had been feeling quickly dissipated. She outreached her hand to Pau'Ka and helped her down from the ship and walked to the others that had gathered around. Neden nodded as she heard Sil'Eph Niir's voice echo in her head, taking up note to help protect the others she instinctively placed her hand on her hip by her sword, keeping her guard up as the others discussed what to do. Eventually finding Dreux in the group of people she excused herself from Pau'Ka for a moment and walked up to him. She pulled him a few feet away and once they were out of earshot she smacked him on the back of the head and gave him a hard glare. "You left me alone with them for eight days, you jerk!" she said in a hushed voice as she smacked his arm again. Dreux chuckled and shook his head at his friend as she hit him, "Hey, hey now...I was doing you a favor, little lady. Because of me you got to spend some time with the Princess as well as learn more about yourself, if not your species in total. So....If anything, you should be thanking me." he said as he nodded towards Pau'Ka and gave her a wink. Neden looked at him and growled, "That still doesn't make it okay, you know. I was practically alone, and seasick that whole time. So what did you do that whole time? Get buddy buddy with Luther?" Dreux chuckled and rubbed the back of his head, "All I'm saying is, I still didn't hear a thank you. And no, Luther kept to himself as did I. I mainly read and practiced on the ship while I was alone. I don't know what you did while you were with the others, but you seem to be in a better mood. So, go back over with your friends." he said with a teasing look on his face. Neden growled and scowled at his comments, "I don't know what you're alluding to, Dreux. But it's not funny..I missed you." she said with a rather somber tone as she looked at her friend. Dreux gave her a smile and a gentle hug, "I missed you too, Neden. Now...I think the best course of action would be finding a place to pitch camp or find a town to stay in for the night." he said as he began walking back to the others, with Neden in tow. The week had gone smoothly for the most part. Sailing was what Vernon and Carmen were used to, so that wasn’t any particular issue. No, the only conflict was that there had been a little bit of bickering between them, Vernon insisting that Carmen remain with the Delmoray as both their navigator and his first mate. Although she really did want to make friends with all the others (And it would have been easy enough for her to swim between the boats), Vernon did make some degree of sense that she’d be needed if they were attacked by another dragon or something. Not only that, but the crew all needed to pull together in order to manage more of the repairs, and as Vernon explained to his less than clever mermaid companion, this might be the last time they saw the ship for a long time. Even though they were busy working, it gave them all a chance to say their goodbyes, Carmen especially popular among the crew; and Vernon’s decision to leave requiring some coordination in order to fill the power vacuum and plan for the future. Still, the nights spent drinking, singing and reminiscing on the good times would serve as fond memories into the future, and were a reminder of just what the goddess had told her. Bonds could be strength; and if she could help everyone get along, that would be the best for the team. Speaking of the team, they needed a name. Sil’s Sailors? Well, they weren’t going to be sailing when they hit land… Sil’s Secret Squad? No… According to the goddess, they were emitting some aura, so that wasn’t particularly sneaky… The Goddess… Group? No, far too bland… Musing on all of this, Carmen decided now was the time to initiate Project Friendship, and so, she needed a target to become friends with and convert to the cause. Vernon was obviously off the table, he clearly loved her (Like, duh), and although she’d made good initial impressions with Dreux and Neden, she wanted to diversify a little, and it would be easier if she could pick someone on their own to really get to know them. There was the invisible lady… Somewhere? Had she vanished again? That was going to be a difficult one to pin down… Then there was the Succubus, the one who’d written on the parchment. Given the hostility between her and Vernon, that one could be saved for later… Looking through the remaining options, the elf siblings, as well as the intimidating shadowy elf and the fairer, lighter elf companion next to him; as well as the other blonde haired woman, Carmen couldn’t really decide. “Heh heh heh… If I can’t decide, it’s time for my secret solution!” Laughing to herself and haughtily placing her hands to her hips, Carmen rummaged around her pack, pulling out a small but simple pair of dice. Grinning, she tossed one up into the sky, letting fate and fortune guide her way to success. Assigning names to the numbers, Carmen squatted down to examine the die as she checked the result. Three. That was… Pointing through the different people, Carmen narrowed her eyes at her target, scooping up her ultimate decision making tool and travelling across the sand to meet her. “Phew! That was a fun trip! Lovely weather, you enjoy sailing? Any troubles getting here?” Carmen immediately bombarded the high elf with questions, ignorant to her inability to speak in the modern tongue. “Not that you’d have forgotten, but I’m Carmen Rufferones, Navigator and First Mate of the Delmoray! Though I suppose that’s not true anymore… I really need to work out a new title… Which means I need to come up with a cool team name…” Mumbling to herself as she tugged on her chin, Carmen got distracted in her thoughts a moment before turning back to Elena. “So, what’s your name, huh? Hey, your dress is pretty, where’d you get it? Do you fight? It’d be a shame if it got wrecked in combat, but if you don’t fight, you can hang with me when things get rough! Vernon’s pretty lazy, but when it comes to fighting, he’s super dependable, he’ll keep us all safe. Well…” Carmen had a tendency towards long and rambling one sided conversation, but Elena would get a chance to interject at some point. Having followed along with Carmen, weapons on his back, Vernon eyed over the remainder of those nearby, looking between Pauka and Korose. He wasn’t one usually for making conversation, but there was something he felt the need to address, moving towards the male of the two. “You there. Your name.” Vernon demanded, tightening his stance slightly, but remaining somewhat nonchalant. Out of everyone in the group, none intimidated him much. Even the apparent warriors of the group seemed fairly amateurish or inexperienced. But this guy… Ever since they’d arrived, Vernon could feel… Something. A pressure, emanating from this man. Like his instincts were trying to warn him of something. And then there was his eyes… Blood red. Unnatural. Vernon couldn’t entirely tell what it was, but regardless, his body could sense the challenge before him. He wouldn’t necessarily provoke the man, but perhaps if the opportunity to spar or test him arose… Well, it would be better than beating some sense into their ‘gallant’ leader. Elena had been preparing to walk back, but was intercepted by a young woman named Carmen who bombarded her with questions which she had next to no time to answer. She attempted to sign, but Carmen didn't seem to take notice of it. So many questions... It was overwhelming. Elena looked to the others around her as they had begun walking away, and then back to Carmen as she attempted to smile and be friendly despite not being able to reply. Finally, a moment of opportunity after Carmen spoke of Vernon being able to defend thems. "No speak." She managed to say in the common tongue. It was one of the few phrases she knew how to say, but she wasn't sure if Carmen would understand what she meant. Vernon approached Korose and called to him, demanding his name. Korose's eye slid to the corner of the socket to look at Vernon, examining him from head to toe before falling back onto his gaze. He wasn't sure what this human wanted, but he was instantly on guard. This man was only a human, and he didn't seem to hear the Goddess which meant he had no divine bloodline as they did. But still... Something just seemed off about him. “…And that’s why we don’t have fish on Wednesdays. That was such a wild day…” Carmen sighed as she finished reminiscing, pausing just long enough to see that Elena was trying to say something. Nodding and smiling, Carmen was keen to hear just what the High Elf thought about her. Having already told so many clever and amusing stories, she had to have earned some respect by this point. "No speak." Elena stated simply. Carmen's face looked stunned… Then immediately dropped into disappointment. She knew she could be a bit of a blabbermouth, but there was no need to tell her to shut up like that! She was just trying to be nice and make friends! Disappointment turning to annoyance and then anger, Carmen huffed, throwing her hands up into the air. “Fine then! If that ‘s what you want I’ll leave you alone!” Storming forward a bit to follow the group, nose held high, Carmen didn’t get far before she turned around and pointed back at Elena. “But just so you know, you’re missing out on the coolest friend you ever could have had!” Taking a few more steps away again, Carmen then stopped once more to turn back to Elena, hands on hips this time. “And I’m not going to regret this at all, you hear me? You’re the one upset by all this, not me. I’m just being respectful and accepting your wishes!” Huffing and continuing further down the path, Carmen had quite the exaggerated walk as she made some distance on her own. Shaking his head at the idiotic display of his Mermaid companion, Vernon turned his attention back to Korose, nodding. “Korose. Don’t disappoint me.” Was all he said, smirking as he moved to go ahead, deciding to catch up to his companion before she got herself into more trouble. Honestly, she was still such a child. The world felt quiet for one moment, as the sun slowly rose, it's light, vanquishing the horrible night, then, life began to move, as the birds began to sing, the vermin scurried around, and the sound of heavy footfalls began to echo though the air, anything underfoot would feel the weight of the large creature. Looking forward, a waft of air caught it, leading the creature to dash forward, a sweet and light scent had caught her nose, leading her to what looked to be a tree, with long beans with it's green leaves. The creature shrank in size, as she began to look more human, harvesting the beans, every so often taking a leaf to chew on, ensuring taste. If it weren't that she was trapped, and had been for about two weeks. This made life rather frustrating. Walking along, there was something in the distance that caught her eye, a ship. As much as she hated those, it was something to get her off that damned rock. Picking up the pace, the giant rabbit-looking person began her rush towards the direction of said boat, hopefully someone was there, and she could return to the mainland, and finally continue this journey she was on. As she got closer, voices were heard, they were young voices, interesting to say the least. With a change in direction, the loud thumping sound approached towards the sounds, where as it was now seen, twelve people were. This was awkward, as they walked on a slight downhill from her, as she could see at least the few in the front, two seemed to be elves, with their ears being sharp, off their heads... It still bugged the woman as to how that even happened, the other two seemed to be human, the others, however, weren't seen, as something stole her mind aside. As, there was another problem that posed, stopping before crashing into these people. She turned to her side to try to change direction, knowing full well this will end in a tumble, avoiding the majority was easy, however avoiding everyone was out of the question, and unfortunately, as the clawed foot slipped, the raven-haired woman with wings at the front, would see a mass flying towards them, seemingly attempting to contort itself from the impact, as the giant hare felt itself tumble along the ground, unsure if they hit the person, and hoping that they weren't underneath the fluff. Use your INK to craft new artifacts in Divinity Unbound. Once created, Items cannot be changed, but they can be bought and sold in the marketplace.